Evening lovelies! I am back from my little weekend holiday feeling both rested and exhausted...not sure how that works but hey! It was really nice to get away for a few days with my boyfriend, parents and my gorgeous doggie and we had a lovely time exploring a bit of Cornwall. My parents are actually staying for the rest of this week but I've come back to uni to carry on with dissertation work (and blogging!). This leads me on to today's post which features one of my favourite international indie brands; Painted Polish. I have two polishes to share with you from the Road to Polish Con series in the lead up to both the New York and Chicago Polish Con's last year. Once again, my good friend Becca ordered these for me alongside her stuff and I'm sooo happy she did! The first of the two I have to show you is 'From the Pier, with Love' from the Chicago Road to Polish Con series. 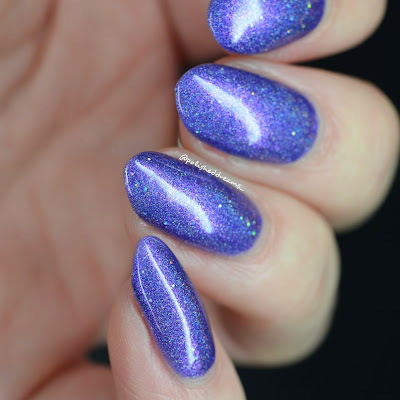 It is described as an "ultramarine blue scattered holo with silver galaxy glitters and a pink/purple shimmer" and I think it's absolutely beautiful. I found the formula tricky to work with on the first coat as it seemed quite thin and I ended up with it flooding off my nail, even if I did thin coats. However once this first coat was down it was much better! Because I had to do thin coats it started off pretty sheer but was easily build-able so is shown here in three coats with topcoat. The second polish I have is 'From Brooklyn, with Love' and I have to admit I've been a bit of a wally and shared these polishes the wrong way round... 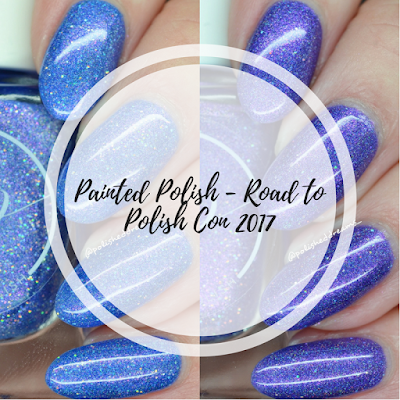 I mistakenly thought that they both came from the Chicago Polish Con in September, despite the fact I wore this one for my birthday in August...woops! 'From Brooklyn, with Love' was actually part of the New York Road to Polish Con series earlier in the year. I've worn it several times so I can't believe its taken me so long to do proper swatches! This is a gorgeous purple holo with silver holographic glitters and pink/purple shimmer and it's definitely up there with my favourite purple polishes! This appeared opaque in two coats in normal lighting but I did a thin third coat as well as I was worried you'd be able to see nail line once I was under the lamps in my lightbox. The polish had a lovely smooth formula and is shown below in three coats with topcoat. I have to say, I think these are some of the best Painted Polish's that I own. Admittedly I don't own half as many as I like but both of these are just stunning! I'm so pleased I could get hold of them despite not going to Polish Con. One of the many bad things about living in the UK and being a poor student eh? When I graduate and get a proper job (hopefully soon..), I will be going to Polish Con as soon as possible! 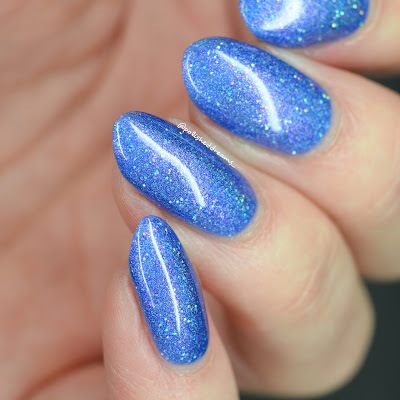 I've just checked Rainbow Connection which is where I usually get my Painted Polish fix and they actually have 'From the Pier, with Love' in stock here so grab it while you can!